It's been a packed week for superfast lens releases, with Samyang's Spring Collection promising some of the best Nikon lenses and Canon's Sumiere Prime line offering the best Canon lenses for cinematographers. Now we have specs and images for the Zeiss' latest Otus cinema lens, courtesy of a leak by ever-reliable Japanese site Nokishita (by way of Canon Watch). The Zeiss Otus 1.4/100 lens will be available for Canon and Nikon DSLRs in two models, ZE (for Canon EF-mount mount cameras) and ZF.2 (for Nikon F mounts). 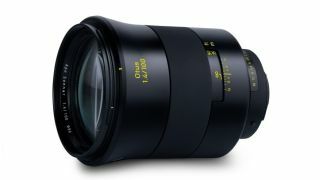 As you might expect for a lens with "Zeiss" and "Otus" in its name, it will carry a substantial price tag: a cool $4,990. Zeiss originally conceived its manual-focus Otus optics for high performance stills photography, to provide the best performance even when shooting at wide-open apertures. Increasingly in the world of 4K and now 8K video, however, Otus lenses have been adopted by cinematographers thanks to their high contrast and minimal color fringing or distortion. This new 100mm f/1.4 iteration joins its 28mm, 55mm and 85mm siblings (all with matching f/1.4 apertures), giving filmmakers a nice set of primes if they have the thick end of $20,000 in their pocket. And for that you don't get autofocus or image stablization. The Canon version of the lens measures 128.8mm and weighs 1,405g, while the Nikon model is slightly shorter at 126.5mm and weighs in at a leaner 1,336g. Both models feature the same construction, with 14 elements and 11 groups, with a maximum diameter of 100.7mm, focus ring diameter of 90mm and a filter diameter of 86mm. The minimum shooting distance is 1m, with a maximum shooting magnification of 1:8.6. Cinema lenses are becoming an increasingly relevant part of the general photographic conversation, as more and more photographers start shooting video. While Otus price tags may have one too many zeroes for many vloggers and up-and-coming filmmakers, for those looking for premium performance the Zeiss range is definitely hard to beat.